You can animate the text, objects, and charts in your presentation to give them visual effects, including entrances, exits, changes in size or color, and even movement. You can use any animation effect by itself or combine multiple effects together. For instance, you can make a line of text fly in from the left while it grows in size by applying both a Fly In entrance effect and a Grow/Shrink emphasis effect. Note: Transitions are another way to add visual effects when moving from one slide to another in a slide show. For more information about how to add transitions between slides, see Add, edit, or remove transitions. You can apply more than one animation to a single object. Simply select the object again and apply an additional effect. Select the slide you want, and then on it, click the number of the animated effect you want to revise. The Animations pane at the right shows all the animations on the slide. To display a blank chart at the beginning of the animation, with the animation effect selected in the Animation Pane, under Chart Animations, select the Start animation by drawing the chart background check box. Choose Play From to preview your changes. Select the text, object, or chart that you want to apply an animation effect to. On the Animations tab, under Entrance Effects, click the animation that you want. To see more animations, point to an animation effect, and then click . On the Animations tab, under Emphasis Effects, click the animation that you want. On the Animations tab, under Exit Effects, click the animation that you want. On the Animations tab, under Motion, click Paths, and then click the animation that you want. Note: You must select the audio or video object on the slide to see the animation effects that are available. On the Animations tab, under Emphasis Effects, click Play, Pause, or Stop. To vary the animation, such as the direction the animated object moves, under Animation Options, click Effect Options, and then choose the variation that you want. You can change other animation options, such as the speed or how the animations starts. For more information, see "Change the order of animation effects on a slide" below. What if "Effect Options" isn't available? The Effect Options button may be grayed out because there are no effect options available for the animation effect or type of object being animated. But before you assume that is the case, make sure the animation number is selected, rather than the object, and then try clicking Effect Options again. You can apply multiple animation effects to the same object. The animations can occur one after the other, or at the same time. The following steps explain how to make an object fly in from the left while at the same time growing in size. On the Animations tab, under Entrance Effects, click Fly In. Select the text, object, or chart again. On the Animations tab, under Emphasis Effects, click Grow/Shrink. Select the animation effect that you just added on the slide. Note: Each animation effect is represented on the slide by a number next to the object, which indicates the order that it will play in. On the Animations tab, under Animation Options, on the Start pop-up menu, click With Previous. Tip: To preview all animation effects on the slide, on the Animations tab, under Preview, click Play. You can view the list of animations on the slide to modify the order they play in, change advanced options, or remove an animation. In the navigation pane, select the slide with the animation effects that you want to view. On the Animations tab, under Animation Options, click Reorder. In the navigation pane, select the slide that contains the animation effect that you want to change. Click in the slide, and then on the Animations tab, under Animation Options, click Reorder. Under Animation order, click the animation effect. 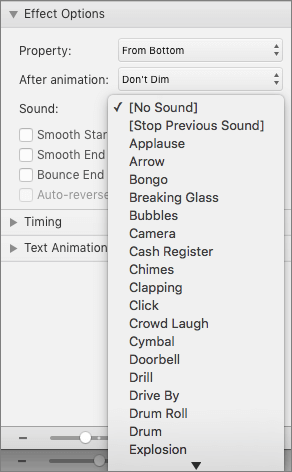 Under Effect Options, on the Sound pop-up menu, click a sound effect. Under Animation order, click an animation effect. To move the animation effect, click the up arrow or the down arrow. The speed of the animation effect is determined by how long the effect plays, or the duration. In the navigation pane, select the slide that contains the animation effect that you want to change, and then click the Animation tab. On the slide, select the animation effect that you want to change. To select an animation effect that is in a numbered stack , you must view the full list of animation effects on the slide. On the Animations tab, under Animation Options, click Reorder, and then click the animation that you want. 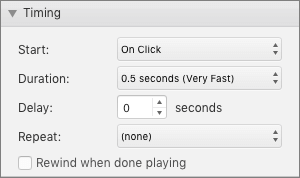 On the Animations tab, under Animation Options, in the Duration box, enter the number of seconds that you want the animation effect to last.